and I was suggested to try opening the file using command prompt. Is that how we run an exe. 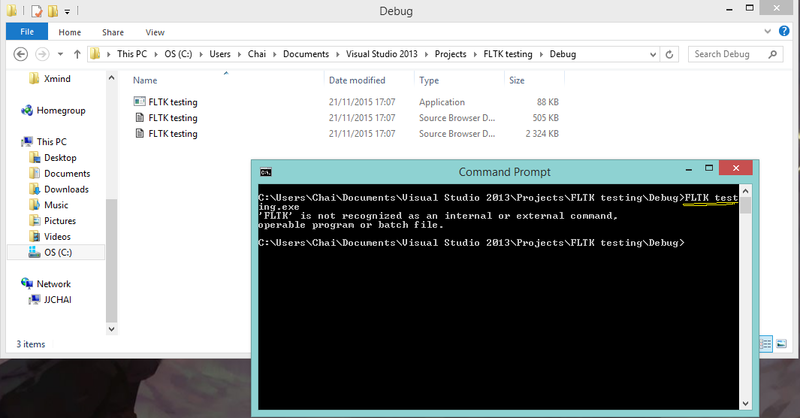 using command prompt? Or I have misunderstood something? Your problem is command prompt does not know anything about spaces in file names. it thinks your exe name is FLTK and testing as a paramter to your application. if you try "FLTK Testing.exe" with quotes as written it will probably run. but i suggest that renaming your exe without spaces for easy access. also if you press F and Tab probably command prompt encapsulates file name in quotes (") automatically. Not the answer you're looking for? Browse other questions tagged command-line cmd.exe c++ or ask your own question.